In the last couple of years, greige has been all the rage and I’m pretty sure it’s here to stay. But before I tell you why, let me start by defining what greige is – in case it isn’t completely obvious. Greige is a marriage of grey and,…..you guessed it……beige. It’s really that simple. Greige paint colours offer the modernism of grey, but the warmth of beige so that a space doesn’t feel too cold or unwelcoming. Greige colours are seen pretty much everywhere in nature via wildlife, wood, stone, vegetation, etc. As a result, greige colours pair well with almost any other colour because they feel familiar which is likely why they have become so popular. In my opinion, greige is the perfect neutral for any home. CAUTION: I'M ABOUT TO GET TECHNICAL FOR A SEC. IF YOU WANNA SKIP TO MY TOP 5 FAVE GREIGE PAINTS, SCROLL TO THE BOTTOM OF THIS POST. So now you know what greige is, but how do you pick the right one? That’s a little more tricky. Neutral paint colours are some of the hardest colours for people to pick because they can carry so many different undertones and the amount of white base in each colour really affects the light reflectance value of each colour (LRV). In case you’re not sure what LRV is, basically it’s a number rating that tells you how much light you can expect a colour to reflect based on its value. For example, the higher the LRV a paint colour has, the more light that it will reflect and therefore the lighter and brighter the colour will be. Make sense? Is a cool light so it will intensify undertones of blue, green or purple. Is a warm light so it will intensify undertones of yellow, orange and red. These rooms are actually warmer (temperature wise) because of their sun exposure so you may want to consider a cooler colour to take away some of the “visual” heat – just a suggestion. Cool undertones will be slightly more noticeable in the morning hours. Note that any paint colour in an East Facing room will start washing out as it gets closer to midday (noon) and then will become more shaded and muted in the afternoon hours. If you spend a lot of time in the space in the morning hours and the cool tones demoralize you, then choose a greige with a warm undertone. Colours will be more shaded and muted in the morning hours. Paint colours in West Facing rooms will start coming to life around noon and then start becoming warmer in the afternoon hours. Like South Facing rooms, West Facing rooms tend to get warmer later in the day because of sun exposure. Remember that cool colours can take away some of the “visual” heat and should be used if you don’t like your room to feel too warm or toasty. 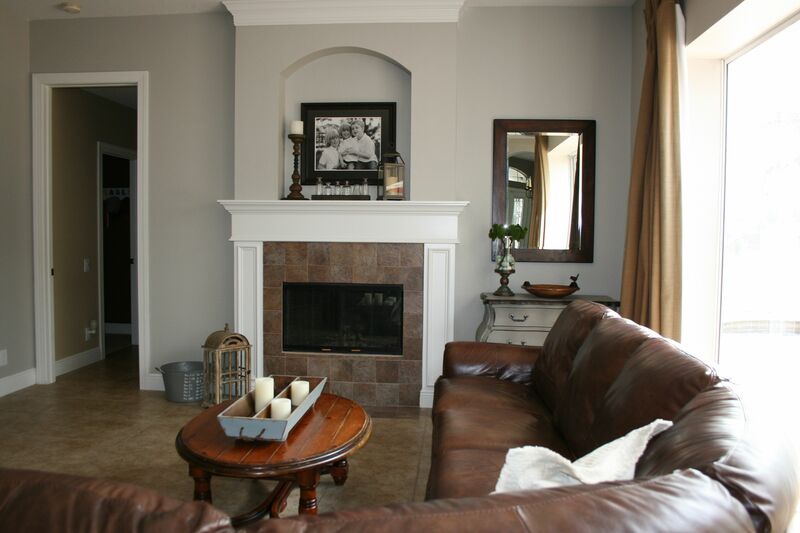 If you want inviting and cozy, you’ll need to pick a greige with a warm undertone. If you want fresh and modern, you’ll need to pick a greige with a cool undertone. Decide whether the visual heat or coolness in a space bothers you. If it does, then choose a greige with the opposing undertone to counterbalance the heat or coolness. This is particularly important if you like light paint colours. As I mentioned, lighter paint colours have a high light reflectance value (LRV). This means that the colours that are prevalent in your flooring, your furniture, outside your windows, etc. will reflect onto the paint and influence its colour. For example, if you have a pink dogwood tree outside your window and you hate pink, you best be picking a paint colour with a lower LRV (somewhere around 62 is usually pretty safe) so that your paint doesn’t pick up the pink hue on your walls. Since the paint colour you choose will inevitably change throughout the day, it’s important to choose one that you like the look of during the hours that you spend the most time in your space. Check out my post on How to Choose a Perfect Paint Colour if you’d like more information on this topic. Although greige paint colours are pretty safe bets for any home, you do need to consider your colour scheme if you want to make the right choice for your home. Choose a greige that coordinates well with the other colours you have in your space. The greige you choose should complement the other colours in your palette, not compete with them. Choose your paint colour last. There are 1000’s of paint colours to choose from. Therefore it’s much easier to find a paint colour that will go with your new drapes/sofa/ or whatever, then it is to find drapes/a sofa or whatever else you have in your space that matches perfectly with the paint colour you already have on your walls. Alright, alright so what are my favourite greige paint colours? See the list below and take note of how each colour changes depending on the amount of light reflected. So that’s the rundown on greige. Simply stated - it’s organic, elegant, and aesthetically appealing. Use it anywhere in your home (wall colour, furniture textiles, flooring, countertops, art and décor, etc.) as the perfect backdrop for the rest of your furnishings and décor to shine. If you’re bored or dissatisfied with the visual appeal (or lack thereof) of your home’s current state, I want to help. After running my own eDesign business and evolving to meet the needs of more design-savvy and price-conscious clients, I’ve learned that most people are now less concerned with the designer “experience” and more focused on having a beautiful home. As a result, I’ve created a program to help them achieve their interior design goals - all on their OWN! If this sounds like something that could help you, this is your chance to learn the basics of interior design and change the way you feel about your home for good! Designing a beautiful, functional home – one that doesn’t disappoint or embarrass you – not only instils pride, but also gives you a level of personal fulfilment that makes you want to share your home with family and friends. The DIY Interior Design course I’ve developed includes over 20 topics, including; the key components of good interior design, why your home is your personal brand, how to determine your design style, where to start your design project & how to stay organized, how to create a functional floor plan, the domino effect's impact on interior design, and a whole lot more. I’ll be pre-launching my DIY Interior Design course on March 31st at an introductory price for eager design enthusiasts. This price won’t last long as I’m continually adding new content to the course. As always, thanks for reading and Happy Wednesday!